Club Penguin Cheats by Mimo777 Club Penguin Cheats by Mimo777: New Club Penguin DS Game Hertbert's Revenge Sneak Peek! New Club Penguin DS Game Hertbert's Revenge Sneak Peek! Here is the newest Club Penguin Elite Penguin Force: Herbert's Revenge Sneak Peek! It will be a grappling mini game on the new Nintedo DS game coming out in May. Part of the game will be to search the caves to track down Herbert. This picture shows a new mini-game, with some new equipment to help agents swing into action. There will also be some big things coming up for secret agents. 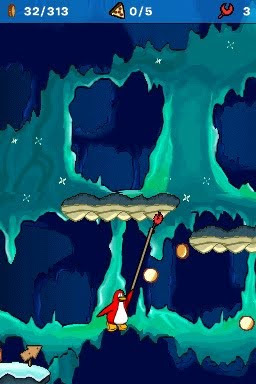 Click here to see all the lastest cheats for Elite Penguin Force AND Herbert's Revenge! Mimo777 I love your site and have been using it since its launch in may 2007! Without you I would not have all the hidden items and pins! I am trying to be a MOD but haven't made it yet! I'll keep trying!! may is that all cool sneack peek!